"How can I convert an iMovie project to MP4 in HD for uploading to YouTube? I've tried doing this from the step-by-step instructions of other people, but the video is blurry. Could you guys give me some useful advices on how to convert iMovie to MP4 with high quality?" Nowadays, a majority of people rely on iMovie to edit video clips and photos thanks to its powerful editing features like add titles, themes, music, effects and more. But after finishing the editing task, all of us face a problem of how to make iMovie video files compatible with smartphones, YouTube, etc for replaying or uploading without limitation. In fact, you can export videos in iMovie to save in .mp4 (a widely used video format for playing on tablets, mobile phones or even uploading to websites). In this guide, you can learn two simple ways to painlessly convert iMovie to MP4 with fast speed. Without doubt, the most direct way to export iMovie project to MP4 is taking advanatge of the exporting features of iMovie because there are some user-friendly presets in iMovie including AVI, BMP, MP4 and more. In other words, users can easily finish the task of iMovie to MP4 exporting with iMovie according to the below easy steps. Step 1: Fire up iMovie > click "Share" on the main interface > hit "Export using Quick Time" at the top menu bar. Then a new window named "Save exported file as …" will pop out. Step 2: Tap "Export" option and find "Movie to MPEG-4" from the drop-down menu. Note: you can hit "Settings" button to make some changes about this file format; please directly hit "Save" button to convert iMovie to MP4 if you don't want to adjust settings. 1. You may find that your exported MP4 files still can't be recognized by your iPhone iPad Android devices or are rejected by some video sharing sites because of video/audio codec incompatibility issues. That is to say, you must figure out another iMovie video converter to convert iMovie to MP4. 2. Besides, this way is only suitable for converting iMovie to MP4 on Mac OS. If you wanna convert iMovie to MP4 on Windows, you'd better turn to other ways. * convert iMovie output files to MP4 with no quality loss, as well as AVI, WMV, MOV, MKV, FLV,MP3, AAC and more 180 video formats and 14 popular audio formats on Mac/Win for replaying and uploading without limits. * directly decode iMovie to iPhone iPad Android for playback with ease, for example, convert iMovie to iPhone 7/7 Plus/6S/6/SE, iMovie to iPad Mini 4, iMovie to Samsung Galaxy S7 edge, iMovie to HTC One M9 and many more other popular mobile devices. * transcode videos exported from iMovie to MP4 with world's fastest speed due to the application of multi-core CPU utility, hyper-threading tech and Intel Quick Sync Video hardware acceleration tech. * work as a iMovie alternative which can edit iMovie video files and even compress video size for uploading to YouTube, Facebook, Twitter and more by trimming, merging, cropping, adding subtitle to iMovie, adjusting bit rate/frame rate/resolution, changing aspect ratio, etc. To begin with everything, you should download this iMovie video file converter on your Mac (macOS Sierra/El Capitan included); you need download Windows version if necessary. Now, follow the below guide. Open up the software on your computer and click "+ Video" to load iMovie video file that you desire to convert or directly drag and drop video file to the program. Note: you can add more than one iMovie file at a time. Select MP4 as output video format from the popping-up Output Profile window. You can also convert iMovie to AVI, WMV, MOV, FLV and more. Click "Browse" button to choose a destination folder for saving the converted MP4 video file and hit "RUN" button to start converting videos from Movie to MP4 with original quality, 4K, HD or SD. Those simple steps are also suitable for converting MKV to iMovie, MTS to iMovie, VOB to iMovie, AVCHD to iMovie, etc. 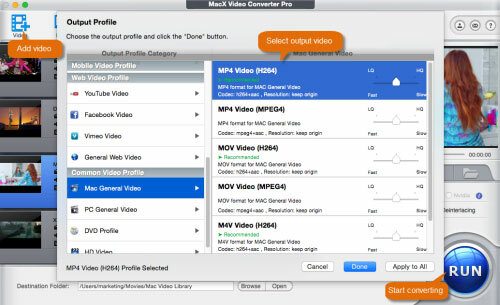 Best video converter - MacX Video Converter Pro offers you the easiest solution to convert videos exported from iMovie to MP4 on Mac/Win with original quality reserved and world's no.1 fast speed.